We realise how annoying this can be and we're so so sorry! There's a whole bunch of reasons why this happens. Usually, it's because the majority of jobs on the platform fill within an hour of the job being posting. Allowing push notifications on your Sidekicker app is generally a better way of accessing these jobs, rather than relying on emails. Unfortunately there can be a slight delay with emails, so it's not uncommon to receive an email after the job has already been filled. How do I allow push notifications? If you haven't already, we encourage you to install our iPhone or Android app and make sure notifications are turned on. This way you'll be informed as soon as a new job opens on your dashboard and you'll be able apply straight away. By getting in quick there's a higher chance of your application being successful. 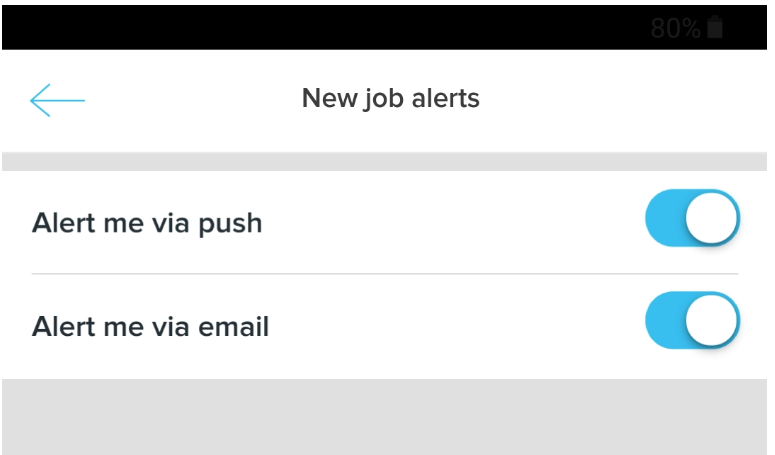 It's super easy to do on your app, just click on your picture, select 'New Job Alerts' and make sure the alert me via push is highlighted. The client may post a job under the category 'Bartender' and then realise they actually require 'Wait staff' after reviewing the posted job details. In this instance the client will update the job post and if you don't have the updated work category approved on your profile, you won't be able to apply for the job despite receiving a notification about it. Sometimes jobs are posted to the entire Sidekicker pool when they are actually intended for a smaller group of Sidekicks or an individual person. The client will often realise they've made this error straight after posting the job and will update the job post accordingly. If you do think there is an issue with the jobs you can see on your Sidekicker dashboard, don't hesitate to reach out to our Sidekicker Support team via the blue Sidekicker chat bubble. Be sure to send through a screenshot of the email and job you're referring to so our team can investigate it for you as soon as possible.